So, you want to build a website. Awesome! Now you just need to work out how to actually get started. Luckily, you’ve come to the right place. If you’ve never built a website before, you’re probably feeling pretty overwhelmed. You’ve no doubt heard about WordPress and you’re interested in finding out more, but you don’t know what to do next. This comprehensive tutorial will walk you through everything you need to know in order to set up your first WordPress site. And you know what? Even if you don’t have a geeky bone in your body, by the time you finish completing all the steps in this article, you’ll have your very own website up and running. Steps 3 through 11 will require you to use WordPress to set up your website. Even if you don’t have experience using WordPress, don’t be nervous about all the “work” outlined above. WordPress is an incredibly intuitive and user-friendly platform, and this guide includes plenty of screenshots to guide you along as you work your way through each step. A web host, or web hosting service provider, is a business that provides the technology and services needed for a website to be viewed on the internet. Web hosts manage special computers called servers. These servers are where websites—like the one you’re about to build—are stored. Then, when visitors from around the web go to your URL, they’re able to access the website from the web host’s server. Price: This depends on which type of plan you purchase, how much space and bandwidth you need, add-ons, and more. Performance: This is a crucial piece of every website’s enduring success. This means your site needs to run fast and it needs to stay online (what is known as “uptime”). Security: While there are other things you’ll need to do to bolster the security of your site, your web host should provide you with secure infrastructure that keeps your site safe from physical harm as well as hackers. Before committing to any one web host, do your research and ensure that they can provide your site with the safe and stable base that it deserves. It’s also important to consider whether it’s even worth it to purchase web hosting. If you’re just planning to run a small blog that’s light on traffic, then WordPress.com is the best option for you. It’s free and easy to set up an account and you can pretty much start blogging right away. Next, you need to select a type of hosting plan. While this may seem like it’s overcomplicating things (after all, why can’t you just pick a web host and be done? ), different hosting plans offer different types of security, performance, and control for your site. Shared Hosting: Shared hosting is the cheapest type of hosting, but that’s because you have to share resources with other websites. Basically, the web host allots a certain space on its server to a group of websites. If you get stuck with one that is a space hog, your website may be adversely affected. That’s not to say it happens often, but it’s something to be aware of. Cloud Hosting: This option is similar to shared hosting in that your site will reside on a server with other websites. However, because your website is in the cloud, this means it doesn’t have one permanent home. If something should happen where resources become unavailable on one server, your site will automatically move over to and be powered by another server. VPS Hosting: Virtual private server (VPS) hosting is for when you want to rent part of a server’s resources solely for yourself; no sharing. This means it’s going to be more expensive than shared hosting, but you’ll have more control over your site’s capacity and performance. There are still restrictions, however, in how much bandwidth or storage you have to work with. Dedicated Hosting: This is when you have an entire server to yourself. Unless you’re about to launch a website with thousands of visitors every day or you’re managing a network of dozens of websites right off the bat, you won’t need this type of hosting. Yes, it’s the epitome of privacy and control, but it requires a lot of work and probably isn’t something you need right now. Alright, now it’s time to sign up. For the purposes of this tutorial, we’re going to use Bluehost so you can get a feel for how easy this is and also catch a glance of the dashboard’s interface. 1. Go to the Bluehost website. 2. Navigate to the Hosting tab at the top of the page. Select your preferred hosting type. For this tutorial, we’re going to select Shared. 3. The plan you select depends on how many websites you plan to manage, how much space you need, as well as bandwidth. As you can see, they do include other items here like an SSL certificate (if it’s free, take it! Read more about SSL here: How to Set Up Free SSL with Let’s Encrypt and Certbot), domains, and email. If those are important to you, then factor them into your decision. 4. On the next page, Bluehost is going to ask you for a domain name. If you don’t have one just yet, don’t worry. A pop-up will appear that allows you to bypass that step. We’ll cover what to do later. 5. Finally, you’ll need to create your account and submit your payment information to Bluehost. You can sign in with Google and populate your information or you can fill it all in from scratch. When you’re ready, agree to their terms and conditions and then hit the Submit button. 6. Upon completing the signup process, you’ll be taken to Bluehost’s dashboard. Looks pretty and well-organized, right? Feel free to poke around if you like. There are certain areas of the dashboard that you won’t be able to do anything with yet because they’re for developers (like the cPanel and FTP) or because they’re paid gated areas. For now, let’s move on and get you set up with a domain name. With your web hosting ready to go, what you need next is a domain name. Generally, the name of your business or blog is going to be the name of your domain, or URL. However, if it’s a popular enough name, it might already be taken. With your web hosting purchased, signing up for a domain name will be a cinch—so long as the name you want is available. Again, for the purposes of this tutorial, we’re going to use Bluehost as the domain registration service. 1. Go to your hosting dashboard. 2. There is a tab at the top of the page that says Domains. Click it. 3. There are a few different options here. If you’re starting a brand new website and have never purchased a domain name before, then select Register. 4. In this next step, you need to do a search for the domain name you want. This will tell you if it’s currently available. Entering a new domain name. 5. On the next page, you’ll see if the URL you want is available. There will also be alternative options that show the availability of your URL using different words or extensions (like .info, .org, etc.). Find the one you want and add it to your shopping cart. Then hit the Next button. 6. Complete the remaining steps, agree to the Terms of Service, and purchase your domain. Now that you’ve purchased web hosting and a domain, you’re ready to set up WordPress. If you’re building a website for the first time, you can’t do better than choosing WordPress. Why? Because it’s awesome, that’s why! No, seriously, though, WordPress is a great content management system because it’s intuitive, scalable, and it’s free. Oh, and you don’t need to know how to code to use it. That’s a big one. The important thing to know about WordPress before jumping in is that there are two versions of the software: WordPress.com and WordPress.org. While both are free to use, they each serve wildly different purposes. If you’re not sure which is right for you, you can take this quiz to find out. In a nutshell, if all you want to do is launch a small personal blog or website, you should use WordPress.com. No fuss, no muss, and you won’t even need to buy web hosting since WordPress takes care of it for you. If you’re interested in giving WordPress.com a go, head over to the website, sign up, and get started. From here on out, we’ll focus on WordPress.org. Rest assured, it may look complicated at first glance, but I assure you, there is a very slim learning curve. 1. Return to your Bluehost web hosting dashboard. 2. Scroll down to the section labeled Website. You should see a button that says Install WordPress. Click it. 3. Follow the installation steps providing by your web host. Don’t worry about themes or plugins at this time. Also, disregard any recommendation to have a pro install it for you. This is an incredibly straightforward process that’s no different than installing other software online. 4. Once WordPress is installed, your web host will email you login details, so check your email and make a note of your username, password and the login link for your newly installed wordPress site. It should look something like, www.example.com/wp-admin, but replace example with your domain name. 5. 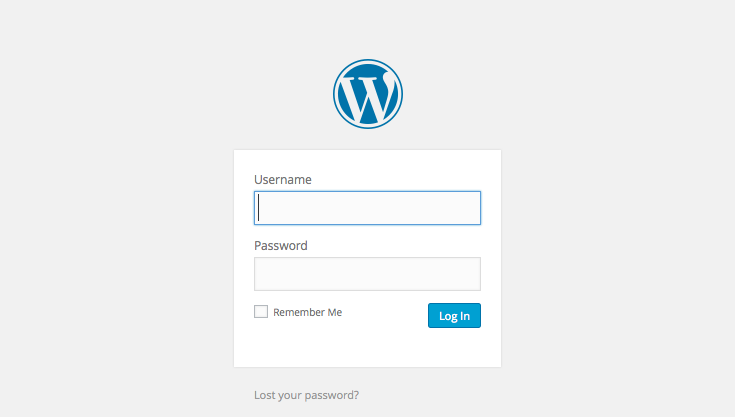 Login to your WordPress site. You’re now ready to get started creating your website! Now begins the fun part – customizing your WordPress site! The WordPress dashboard when you first log in. Changing how your blog looks and feels is one of the most fun and exciting things about creating a website. After all, you want your website to match your style. What you need first and foremost is a theme. A theme is just a fancy way of saying a pre-made design, template or skin. Professional WordPress designers have created these themes and they often are created with a specific website type in mind. You can find themes for portfolios, blogs, restaurant websites, professional services, e-commerce, and much more. There are literally thousands of WordPress themes available, both free and for a fee. Where can you find them? Well, if you’re on the WPMU DEV website, you can always start with one of our themes. You can find basic themes for free in the WordPress.org Theme Directory. You can find premium ones in a theme marketplace like ThemeForest. You’ll need to purchase them there, download the zipped files and install the theme on your website. Or you can purchase them directly from a web designer’s website. Be warned: there really are way too many themes to sort through on your own. It will quickly become overwhelming and frustrating. We suggest you check out these theme-related blog posts. WPMU DEV has put together roundups on the best free WordPress themes, the best premium (paid) WordPress themes, and everything in between. Use these as a starting place so you can get a sense for what’s out there and what you ultimately want to use for your site. And don’t forget to play around with them! Every theme you run into enables you to preview and demo it before you download or purchase, so take advantage. Poke around in the different pages. Click on the buttons. See what sort of additional features are included (like animation, portfolios, etc.) Make sure it’s exactly what you want. 1. On your WordPress dashboard, go to the Appearance tab on the sidebar and click Themes. Navigating to the Themes section in WordPress. 2. If you’re going to use a theme from WordPress.org, select Add New at the top of the page. Do a search for the theme on the Add Themes page and once you’ve found one you would like to use, click Install. Install a free theme from WordPress.org. If, instead, you’re using a theme that you have purchased from a WordPress theme market place or developer, you will need to upload the .zip file you bought on the Add Themes page. At the top of the page next to “Add Themes” click Upload Theme and upload your theme’s .zip file. 3. The Themes pages will refresh and the theme you installed will now display an “Activate” button. Click to activate and the theme will be applied to your site. 4. At the top of the page, click the title of your site, in my case “My Awesome Website” to view the front-end of your site. You should see your new theme. With your theme now installed, you can find it again by going to Appearance > Themes in the sidebar in WordPress. When you’re ready to get crazy and start customizing your theme, navigate one tab down to Customize. The WordPress Theme Customizer in action. You can also use the Customizer to make custom CSS changes to your website, but this is for advanced users only. 1. With the Theme Customizer open, click Header Media. 2. Within this tab, you can replace the header image and even choose to display a video in .mp4 format or by entering a YouTube video URL. For now, we’ll replace the image, so click Add new image and select a new image from your media library, or upload a new one. Once you have selected a theme and made simple customizations, there are just a few more steps and then you can create your first blog post. In addition to customizing your site’s physical appearance, you may also want to give the basic settings on your website a tweak. Typically, the default settings in WordPress are fine as is, but they also could use some slight improvements. 1. To access your site’s settings, go to the Settings tab in WordPress. Within this tab, you’ll see a number of options to choose from. Let’s focus on the most important ones. Aside from the URL (which you shouldn’t change), feel free to update the rest of the information found in this tab. If you’re running a site in a language other than English and know that your target audience resides outside the U.S., the bottom-half of this page’s settings will be important to update. 3. Next, the Writing section in the Settings offers some advance options for posting to your blog via email. We won’t worry about this section for now. 4. Click on Reading in the Settings tab. If you’re launching a blog site, these settings will be especially important to pay attention to as they’ll give you better control over your blog’s display. You may also choose whether or not you want search engines like google to index your site so it shows up in search results. 5. Under Discussion in the Settings tab, you can control the comments on your blog. You can force people to log in before submitting a comment. Control how many comments appear under each post. Set moderation rules that give you full veto control over any comment that comes in. Enable avatars so that your commenters can personalize their identity. 6. In the Media section, you can specify how WordPress resizes images that are uploaded to your blog. Leave the image sizes as they are as you don’t need to change them for the time being. 7. Last, but not least, go to your Permalinks settings. This is where you can set the basic URL structure rules for your site. For starters, that URL doesn’t look very nice. What does “?p=123” even mean?! So go ahead and choose the Post name option and click Save Changes. Plugins allow you to add great functionality to your WordPress site without having to mess with code or ask a web developer (or geeky friend!) to help with your site. While the core WordPress software—and often your theme—provides the basic building block for creating a site, plugins are bits of software you can add on. There are plugins for just about everything, such as adding a contact form or social media, creating a photo gallery, and even tracking who visits your blog. Currently, there are over 48,000 free plugins available to download in the official WordPress plugin directory. Have a search through the repository and you’ll get an idea of the kinds of features you can add to your blog. For now, let’s work through an example of how to set up the Smush plugin. 1. Go to the Plugins tab in WordPress and click on Add New. 2. Similar to what you did when searching for a theme, use this page to search for new plugins. If you know the name of the plugin you want to use, type it into the search bar on the right. You can also search based on the functionality you want to add (e.g. “popup”, “analytics”, “ecommerce”). Or, if you’ve purchased a plugin from a third party, you can use Upload Plugin to add it to your site. For now, let’s focus on searching for the Smush plugin. You’ll see that WordPress gives you other related plugins in their search results, too—something that will come in handy if the plugin you want is unavailable or didn’t work out the way you wanted it to. 3. Once you’ve found the plugin you want, click on Install Now. After it’s finished installing, you’ll see that the button has now changed to “Activate.” Click on the button so you can get your plugin up and running on your site. 4. Usually, there’s no need to update the settings for plugins unless they’re tools meant to help you create a new design element on your site (like a form). However, if you’re curious as to what sort of settings your plugin comes with, simply navigate over to Plugins and click on Installed Plugins. The plugins listed in blue are active; the ones in white are not. Each of them will include a Settings, Deactivate, and Edit button. Deactivate will enable you to remove a plugin from your site if you change your mind about it. It’s worth noting, however, that you should only install plugins that you plan to use. Leaving unused plugins on your site not only slows down your site, but can also have security implications. Settings are where you can customize what your plugin does. It can be rather daunting working with plugins for the first time and deciding what your website needs (or doesn’t need!). I’d suggest taking a look at this brief guide on how to determine the quality of a free plugin before adding anything new to your site. WPMU DEV also has a great set of plugin blog posts that are worth checking out. Once your site is running smoothly, these might serve as inspiration for what you want to do next with it! 1. Navigate to the Posts tab in the WordPress sidebar and click on Add New. 2. A new screen will appear. This is the WordPress text editor interface. It is on this page where you will compose your blog post. One quick note regarding how to write your blog: if you’d prefer to work in a WYSIWYG (meaning “what you see is what you get”) visual editor where you don’t have to worry about coding, then make sure the tab in the top-right corner of the text box is set to “Visual.” This will ensure that what you type in the box is how it will appear on your website. 3. You’ve now got free reign to create your post as you see fit. Enter a title at the top of the page. Type out your blog post within the text editor box. Update the rest of the post’s settings—like categories and tags, SEO (if you added the All in One SEO Pack plugin from earlier), and more. Or leave those for now and just focus on writing. 4. When you’re done writing your post, you have a few options for saving your work. They can be found on the right-hand side of the screen. If you’d like to see how your post will appear on your site when you publish it, click Preview. This will open a new tab with a live preview of the blog post on your site. This gives you a chance to make sure your blog is in tip-top shape before you push it live. If you’re not ready to publish your post, click Save Draft and this will save a copy of your blog post in WordPress. You can save your draft as many times as you’d like. After you exit WordPress, you can always come back to the post by visiting Posts > All Posts in the sidebar. You can also choose when you would like to publish your post. See where it says Publish immediately? Click Edit and choose the date and time you would like your blog post to go live. When you’re ready for the world to see your blog post, click Publish. Every good blog post deserves at least one good image. (The same goes for any other page you create for your website.) Images help break up large chunks of text, give readers extra context, and just look plain cool. 1. Open the post you want to add an image to. Insert your cursor into the text editor where you want the image to appear. Then click the Add Media button in the top-left above your text editor tool. 2. A new modal window will appear, which you can drag and drop your image onto or you can click on Select Files and find the file on your computer. Insert media, aka images and other files. 3. With your image uploaded into your library, you can give it a title, caption, and alt text (this is optional). You can also update the size of the image, how you want it to align on the page, as well as whether you want it to link anywhere. When you’re done updating the settings, click Insert into post. You’ll now see the image appear in the visual post editor. Firstly, let’s get something out of the way: pages vs posts. A post is a content entry listed in reverse chronological order on your blog’s home page. Due to this reverse order, posts are meant to be timely. You can sort posts by categories and tags. A page is static and not listed by date. Some common examples include the About and Contact pages you might find on a website. For those of you hoping to create a website for your business or who simply want to add more pages than just the blog, you’re in luck. Because adding a page to your site is really no different than adding a post. You can find your WordPress site’s pages under the Pages tab. When you want to create a new one, simply click Add New. You’ll then see an interface that’s nearly identical to the one you used to create your first blog post. There’s no need to reproduce the steps here on how to build a new page since the process is the same as what you’d do with posts. Add the content—title, text to appear on the page, and images—and then update the settings accordingly. You’ll even use the same Save Draft, Preview, and Publish settings. One thing to note, however, is that hitting the publish button will not necessarily push the new page to your website. That’s because your pages need to exist within a navigational, or menu, structure. We’re going to cover that in the next step. Final step, guys! Are you ready? 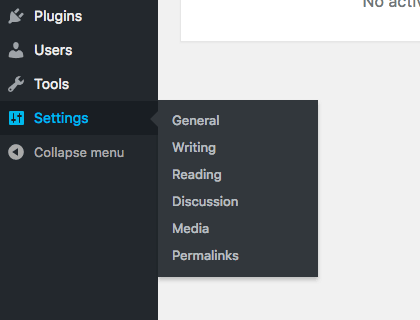 Okay, so WordPress menus. You might also hear these referred to as navigation, too. Regardless, this is a trusty tool that every website needs. You don’t want visitors getting lost as they make their way around your site, right? Think of the navigation as their guide. It’s also your way of telling them what the most important stuff is. If you’re starting with a single page blog, you’re probably not going to need a menu. Once you do expand beyond that, however, you will. And this is how you create one. 3. From this page, you’ll be able to set up your menu. On the left is a widget that contains all the pages, posts, links, categories, and other content that exists on your site. Search for the pages you want to include in your navigation and click on the checkbox next to each one you want to include. Hit the Add to Menu button and you’ll see your page(s) appear under Menu Structure in the right-hand box. 4. Every website’s menu structure will be different, but if you want tips on how to nail the perfect navigation for your site, read this. Once you know what you want to do, use this Menus Settings tool to drag and drop your menu’s pages into whichever order and hierarchy you want. Hit the Save Menu button when you’ve finalized your navigational structure, and then your menu and new pages will be live on your website. You’ve set up your very first WordPress website and published a blog post. Nice work! In the above Ultimate Guide to Setting Up a WordPress Website, we’ve covered just the basics. At some point, you may find that what you’ve created here today isn’t enough—and that’s fantastic! If your blog has become a trusted news source, if your product catalog is ready to expand, or if your professional services need a more polished-looking site, there’s always more you can accomplish with WordPress. That’s the beauty of working with this platform! Even if you decide that this basic framework is good enough for your site, we always suggest WordPress users check in with their site regularly to see if any small tweaks are in order to improve its overall performance. Sure, your site looks good right now, but design trends and consumer preferences change so quickly that it’s good to always be ready to adapt. Over to you: What’s been your greatest challenge in working with WordPress to date? We’d love to hear any tips and tricks you’ve developed to get around those hurdles.